Did you ever wonder if there's a toy version of your favorite DeSoto? Well, chances are that one was made. During the Forties and Fifties, just when DeSoto was entering its most productive years, so was the toy industry. The booming toy market, aided by new plastic molding techniques, was creating more toys in greater variety. Toy DeSotos appeared as everything from train set accesories to dealer promos. Promos are of particular interest to DeSoto owners. Dealer promos were originally sold or given away by dealerships, sometimes presented as gifts after a testdrive. The idea was that the little ones would help sell the big ones. DeSoto promos first appeared as cast white-metal cars in the late Forties. 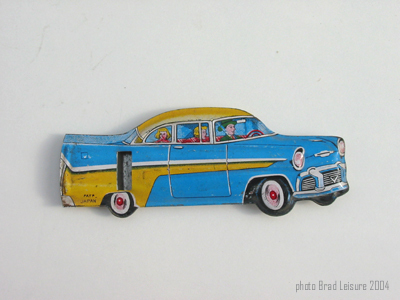 In 1955, John Hanley of the Ideal Model company introduced the first plastic DeSoto promos. Ideal Model was renamed Jo-Han after the Ideal Toy Company complained, and it is possible to find Hanley's '55 DeSoto promo with his original Ideal logo or none at all. Jo-Han had the exclusive DeSoto promo and model contract through 1960, when the last DeSoto promos were made. DeSoto toys are just as appealing as promos. Meccano-Dinky Toys of England and France had a love affair with American cars in the Fifties. They produced many different makes including several Chrysler Corporation cars. Among them were the 1957 DeSoto Firesweep, and 1959 Australian DeSoto Diplomat. 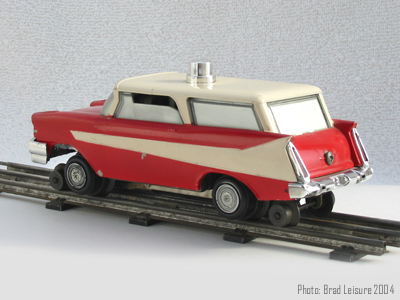 1958 DeSoto station wagon by Lionel -- This car was designed to run on the train track as the inspection car. They were painted red and white with silver windows and working headlights and taillights. Some artistic license was used on the taillights which resemble Plymouth units. It had a heavy train chassis with an electric motor like any Lionel locomotive. 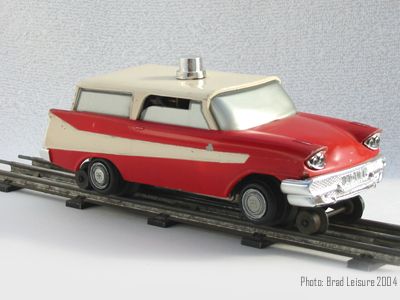 One of the most collectible DeSoto toys is the 1958 Station Wagon "Track Inspectors Car" made by Lionel. This toy featured a plastic body painted red and white fitted over a very heavy metal frame with steerable wheels. The bumpers were chrome plated (vacuum metalized) and the headlights and taillights lit up. Even the kiddie car craze in the 50's featured DeSoto cars. Intact examples are extremely hard to find and quite pricey. Toy and memorabilia collecting really enhances the collector car experience. DeSoto owners are encouraged to seek out DeSoto toys and share their finds here. Explore more toys in DeSmall Ones Gallery. Just click an image for insight, or Return to Exhibition Hall.